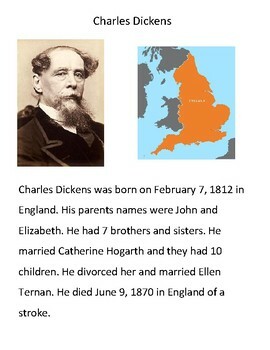 This lesson includes a modified biography of Charles Dickens, biography template, and Key Concepts. I use Key Concepts to narrow down the focus of what the student should be learning into 3-5 bullet points. I decide these concepts by looking at the bigger picture of the lesson- from a functional approach. What should the students get out of the lesson? What should we as adults know about these topics? 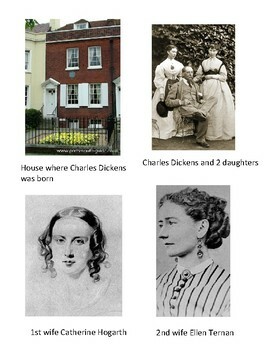 Key Concepts also includes important vocabulary to get out of the lesson. Key Concepts are intended to guide the adults (IA or general education teacher) into what to focus on with the student. For these materials, my student was in a 7th grade English class. 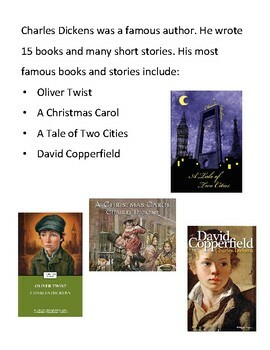 The class was reading A Christmas Carol by Charles Dickens.